Explain, using a tariff diagram, the effects of imposing a tariff on imported goods on different stakeholders, including domestic producers, foreign producers, consumers, and the government. Explain, using a diagram, the effects of setting a quota on foreign producers on different stakeholders, including domestic producers, foreign producers, consumers, and the government. 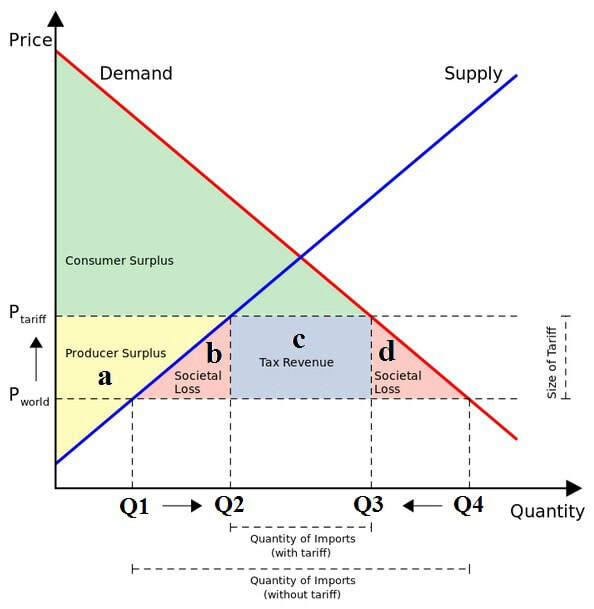 Explain, using a diagram, the effects of giving a subsidy to domestic producers on different stakeholders, including domestic producers, foreign producers, consumers, and the government. Describe administrative barriers that may be used as a means of protection. Protectionism is trying to use restrictions such as tariffs to boost your country's industry, and shield it from foreign competition. The intention is that they buy cheaper local products instead - boosting your country's economy. In theory, taxing foreign goods will mean that US companies will buy local goods instead. Critics point out the US gets most of its steel from Canada and the EU - staunch US allies. Many wealthy countries have shifted from manufacturing economy to a service based economy. "If other governments around the world pursue the same policies, markets contract and world economic activity is reduced."